During the years from 1982 to present, in addition to regular contributions to worship, the WUMC bell choirs of all age groups have at one time or another participated in festivals, workshops, and community outreach events. Presently the Wesley Carillon plays monthly in worship utilizing the full 5 octaves of Malmark bells, the 5 octaves of handchimes, and occasionally the aluminum bass bells. Children of Hope and Alive! handbell choirs, (children and youth) ring in worship several times throughout the year. The late Joe Chalker, longtime member of WUMC, was the founding director of our church’s adult bell choir. Memorial funds were designated for the purchase of a three-octave set of bells, rung for the first time in worship on Christmas Eve, 1982. In January 1984, Linwood Row assumed leadership of the choir that became officially known as “Wesley Carillon.” During the next several years the bell program expanded to include a youth handbell choir and “Bells on the Hill”, an outreach from our church for Western Maryland College students that lasted for several years. Within a few short years the bell program was expanded with the addition of the “Praise Chime Choir” for children under the leadership of Bill Pond, using a three-octave set of handchimes (37) purchased from Malmark. In Spring 1992, Larry and Debbie Henning were hired as interim directors to replace Linwood Row, who “retired” from his volunteer directorship. In the fall of 1993, Laura Baker was hired as director of handbell choirs and youth choral groups, a position she held for 17 years. Under Laura’s leadership, participation in the bell program continued to grow to include “Praise Bells” choir for children and “Alive & Ringing” choir for youth. 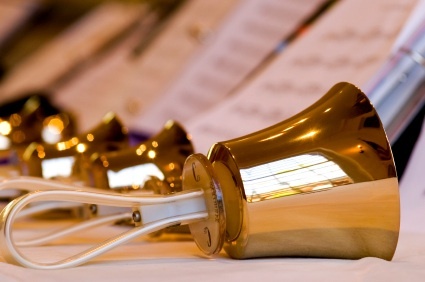 In the fall of 2010, the leadership for the handbell choirs became all volunteer including Peggy Brengle, Handbell Coordinator; Kyler Brengle, Wesley Carillon (college students & adults); Bill Pond, Alive and Ringing (grades 6-12); Johanna Evans (2010) and Donna Kattermann (2011) Praise Bells (grades 3-5). When in our music God is glorified .